Rumours of a Surface Pro 4 are picking up the pace, with the most recent suggesting that Microsoft is working on a 14-inch tablet to take on Apple's rumoured iPad Pro. According to Chinese IT website cnBeta, it is being developed alongside a standard 12-inch Surface Pro, with both models set to sport a 2,160 x 1,440 pixel-resolution display like the Surface Pro 3. They are expected to come with Intel's power-sipping Core M Broadwell CPU inside, rather than Intel's Haswell dual-core i5 and i7 variants. 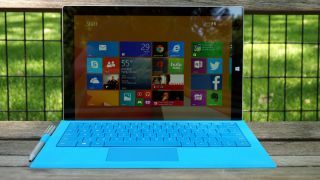 Broadwell would allow Microsoft to make the Surface Pro 4 fanless and near-silent in operation at the expense of raw power. Other suggested specs include 8GB or 16GB of main memory and a maximum 1TB of internal storage. Apple's rumoured iPad Pro has reportedly been delayed until September due to production issues related to its larger 12.9-inch display.